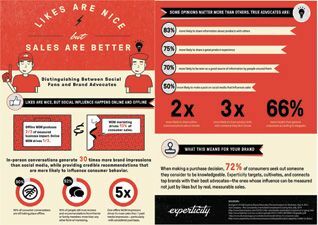 “Likes are nice but sales are better.” An Experticity infographic states: “Let’s face it—not all social followers are created equal. Likes, shares and impressions are nice. However, to assess the value of each click, you need to distinguish between the casual fan and the passionate advocate. The latter’s word of mouth (WOM) drives more sales. It also amplifies your social and digital marketing efforts.